Empires & Dungeons Game Review - Download and Play Free Version! 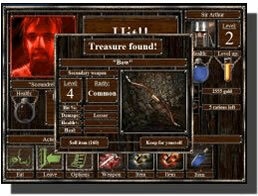 Fight for the crown by building armies and crawling dungeons in this addictive fantasy strategy and roleplaying game! It is a dark time of war in the land. Many lords are attempting to seize control of surrounding territory to expand their empires - including you! 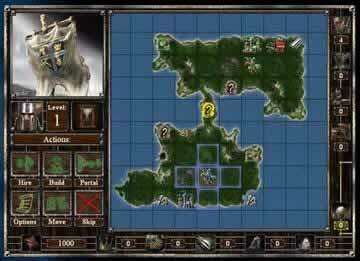 Empires & Dungeons is a blend of fantasy strategy and role playing. Build your army to attack and defend enemy factions. 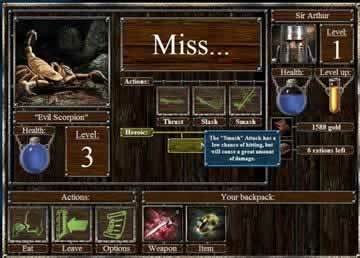 Build your main character by crawling dungeons and fighting monsters. You will need both to succeed. To get the money you need to build your army and construct advanced buildings to get better soldiers, your hero must explore dungeons. You will come upon many different creatures that when defeated, will give you treasure, weapons and experience. Level up your hero to become a better fighter. You must also choose your moves in the main world carefully. Every move you make, your enemy will make one as well, getting stronger with each step. Use your brains and your brawn to conquer Empires & Dungeons! Empires and Dungeons is a rather interesting game that mixes elements of fantasy dungeon-crawling role-playing games and a medieval strategy title. You take on the role of a valiant lord in a contested land and must fight to conquer the towns and enemy castles on each map to achieve total victory. The world map is very easy to navigate and you can simply click adjacent grids to move your army around the map to collect resources, attack towns, and find dungeons for your hero to explore. This is where things get really interesting in that your hero sets out to explore the dungeons on his own and the role-playing elements of the game arise. Each dungeon is made up of a series of rooms that are randomly generated, which helps to keep things fresh, and you mostly spend your time fighting enemies in each room or chancing upon traps and items. Combat is pretty straight forward as you click to either thrust, slash, or smash, each dealing progressively more damage but having a less likely chance to hit. At certain intervals you also get the option of performing heroic moves during combat, including strike which always hits and deals quite a bit of damage, heal which refills a portion of your health bar, or retreat if things aren't looking good. As you gain experience and levels your health, damage, and hit percentage continually increases, but that is about the limit of customization other than purchasing or finding hero items to increase your stats. This rather linear RPG system allows for fast and casual play which is great if you like more action, but doesn't reach the depth some RPG fans might be accustomed to. The variety of maps and scenarios, each with their own themes, definitely help the replayability of this title. Whether it's searching for a voodoo doll to pay off a magician to curse enemy lords or collecting eggs to calm an angry dragon, the themes do a great job of keeping things interesting even while most of the main gameplay is the same. That is the only possible downside to Empires and Dungeons in that things can get a little repetitive as you collect resources, train your army, and level up your hero. With a great tutorial and the option to unlock up to 7 difficulty levels, Empires and Dungeons is a great title for new players and challenging enough for fans of either genres to find enjoyable. Overall Empires and Dungeons provides some rather addictive gameplay and mixes two gaming genres quite well, but the gameplay may not appeal to everyone so at the very least give the demo a try and check it out for yourself.